For the NHL, a flight of fancy from a group of beer drinkers provided the impetus for the outdoor-game boom that has shaped the past decade for the League. 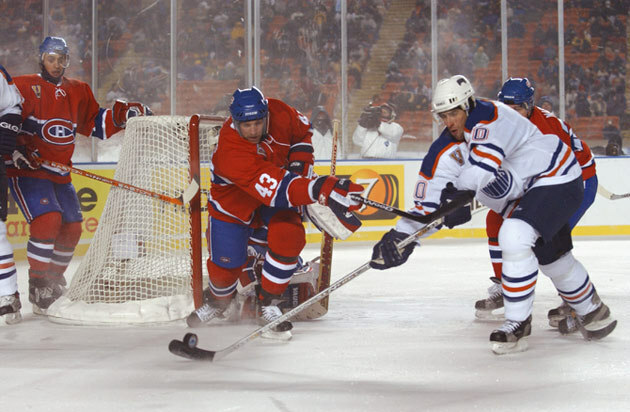 Patrick LaForge, who as the president and chief operating officer of the Edmonton Oilers, was one of the driving forces behind the League's first regular-season outdoor game, the 2003 Heritage Classic played at Commonwealth Stadium on Nov. 22. His idea, sketched out on a flight back to Edmonton, found its roots in a survey of Molson customers. The game, played on a brutally cold day in the City of Champions featured the Oilers and the Montreal Canadiens. It was preceded by a Legends Game that proved to be one of the most memorable alumni games in the history of the sport, if not all sports. The successes of that day, which spawned the outdoor-game boom to follow, provided the blue print for a series of Winter Classic games beginning in 2003. It also spawned another Heritage Classic, in Calgary in 2011, as well as one to be played in 2014 in Vancouver. The four-game Stadium Series to be played in three different venues during the 2013-14 season is also a linear descendant of the audacious plan by the Oilers to take the game back outside to its roots. With the 10-year anniversary of the landmark event looming next week, as well as the approaching 2014 Bridgestone NHL Winter Classic in Ann Arbor, Mich., coming into focus, NHL.com revisited the magical spectacle in Edmonton that forever altered the course of the National Hockey League and hockey in general. In this Sunday Long Read, 25 different individuals involved with the day share their memories of a game -- and a spectacle -- that proved to be beyond the strongest imaginations at the time. The most unique chapter in modern hockey history began with market research conducted by Molson Breweries, to hear LaForge tell it. At the time, LaForge was serving as vice president at Molson and he was trying to digest the research gathered from a questionnaire handed out to the company's customers in the early-1990s. By the time he became president and COO of the Edmonton Oilers, that research would remain with him and lead him down a most unlikely path into the hockey history books. Patrick LaForge, Edmonton Oilers President/COO: I was reading some research when I was with Molson from Canadian male beer drinkers. This was just asking people between 18 and 35 who drank beer what was a fantasy of theirs. A lot of things come out of those open-ended questions. One of the themes that came about was seeing NHL players play a pond hockey game. At the time it registered with me. The grandiose idea of professional hockey players competing outdoors remained in the background with him. But, it was a weekend trip to Los Angeles for the 2002 NHL All-Star Game that truly set the plan in motion. The initial idea, sketched out between LaForge and Alan Watt, another Oilers executive at the time, had the Oilers playing on Lake Louise. Then, LaForge heard about another outdoor game and his plans changed. Further details on this special NHL event, including information on ticketing for season-ticket holders for each team and national broadcast information will be released shortly. Fans interested in more information on ticketing, further news and special offers around the event should register right now to receive more information at nhl.com/2014heritage. As a supporter of the 2014 Tim Hortons NHL Heritage Classic, the 37 hotel members of the Vancouver Hotel Destination Association will be featuring weekend packages on their booking site, bevancouver.com. LaForge: I'll be damned if we didn't find out, news to me, that Michigan was going to play Michigan State that fall in the first outdoor game. That was the first one I had ever heard of. Our 25th anniversary was coming up in 2004. So we were thinking that might be a reason to go back to the NHL and ask for the NHL All-Star Game. It had already been awarded to Minnesota at that point, but we could negotiate with Minnesota and see if they could put theirs back a year so we could celebrate our 25th anniversary. With a basic concept from which to work, LaForge called NHL Commissioner Gary Bettman and pitched him the idea of the Oilers hosting some sort of outdoor hockey event. Initial discussions involved an exhibition event. But LaForge soon called Bettman back looking to raise the stakes. LaForge: I phoned Gary again and said, "We would like to play a regular two-point game." He said, "Are you kidding? Who would do that?" We have Commonwealth Stadium sitting there and it seats 65,000 and we have a group of guys we're pretty sure can make ice. He said, "Call me back when you get another team willing." I had on our list the New York Rangers, Calgary Flames and Montreal. 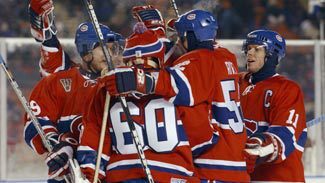 The first team I called was the Montreal Canadiens and my distant cousin, Pierre Boivin, who was my counterpart back then as president of the Habs. My mother is a Boivin. We're distantly related. Boivin wasted little time in accepting the offer from his distant relative. Just like that, the date was set. As word spread of the game, the reality of pulling off such an event started to dawn on everyone involved. Specifically, it dawned most heavily on Dan Craig, the man who would be responsible for constructing the frozen stage upon which LaForge's fantasy would be brought to life. Dan Craig, NHL Senior Director of Facility Operations/Ice Guru: It was first brought to my attention in the middle of the summer the year before the event. You're talking about it in the summer time, so you don't realize how much trouble you can get yourself into by saying, "Yes, this is going to be a piece of cake when it gets cold." We just didn't realize it was going to get that cold. Shawn Horcoff, Edmonton Oilers forward: I remember when the idea first came out we were kind of blown away by it. We just didn’t think it was kind of feasible or how it would be pulled off, but they did a really good job. Michael Ryder, Montreal Canadiens forward: I knew guys were excited. It was something different and as a kid growing up you always played outside so it was pretty neat to play an NHL game outside and it was in Edmonton. Kirk Muller, Canadiens alum: Edmonton had a great idea. Let's have a fun, outdoor game. We all just went to the game saying, "Wow, what a fun thing to do." Two prestigious groups coming together to play an outdoor game. No one knew it was going to be such a huge hit. Jarret Stoll, Oilers forward: I'm from Saskatchewan, so it was kind of close. I think I had about 20-25 [ticket requests]. They made us each purchase a certain amount, like six or something. It’s Edmonton. It’s a Canadian city. It’s those two franchises. That’s going to be a no-brainer with ticket requests. Jeff Beukeboom, Oilers alum: I was working for the Oilers at the time as an assistant coach with their minor-league team in Toronto. So, I obviously heard more about it than the person on the street. I didn't really think about going to it because I was working. But Kevin Lowe asked me to come and be part of things. It was great, because there were a lot of friends there from my playing days. Craig: it was a timeline crunch. From the time we had [the stadium] to the time we played the game, we were under the gun. At that time, we built it as we would a normal community rink with a sand-based floor. That's the technology that we knew, it had been proven for 50 years. We did the Michigan-Michigan State game in 2001. But that was on the aluminum floor, basically a cousin to the floor we have now [for outdoor games]. Doing the one at Michigan State definitely helped prepare me for the size this one was. You're never prepared for the arctic front to come into Edmonton quite as vicious as it did in November. For us, it wasn't so much the challenge of the cold. It was how much snow we had. We basically spent two days removing snow. It was hard work. We were always out of bed by 5:30 a.m. and at Tim Hortons by 6 and down to the rink. We'd leave the rink by around 9 p.m., have a bite to eat, fall into bed, get up and do it all again. Nov. 22 was designed to be a celebration of hockey and it remained the goal of all those that put in so much hard work to make Commonwealth Stadium the perfect venue. But, Mother Nature almost stole the spotlight as a massive artic front rolled across the Albertan Plains, dumping huge amounts of snow and sending temperatures to dangerous lows. On the morning of the game, participants woke up to minus-25 degrees Celsius temperatures and during the afternoon the cold front dipped temps as low as minus-30 (minus-22 degrees Farenheit). Still, the show went on. More than 57,000 people braved the elements to see a pair of games. 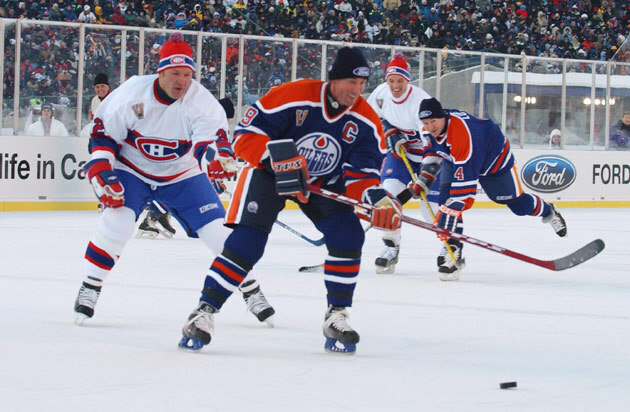 The first, the Legends Game, featured most of the biggest stars from each franchise, including Edmonton's Wayne Gretzky and Guy LaFleur from the Montreal Canadiens. Rarely has an alumni game been more anticipated or better delivered on its hype. Forget the 2-0 scoreline in favor of the hosts, this game delivered enough thrills for a lifetime. Wayne Gretzky, Oilers alum: It was wonderful. It was one of the greatest days of my career. I'm not a big believer in old-timer games. I think that people don't want to see us play when we're slow and old. They like to remember when you could actually play. It was one of the great days of my life. Ryan Smyth, Oilers forward: The neat thing was the game before. A few of us strolled out to watch the old-timers game. It was pretty special to see that. But obviously being an Oilers fan and a Gretzky fan and seeing him and [Mark] Messier back was good. LaForge: When the alumni came out, the roar in the building was incredible. People were dancing. It was so freaking cold, it was unreal. But people were so excited to see them on the ice again. Between periods, the ice was shaved up and the players took shovels. Here we had these great players, true champions, many of them with three or four [Stanley Cup] rings, scraping the ice and throwing it over the boards. It was phenomenal. Muller: Seeing Guy Lafleur shoveling the ice after the period, like we used to do as kids. It was pure innocence. That's what made it so special. Chris Nilan, Canadiens alum: We were warming up and I went to the bench to sit down. They had the heat on the benches like they do in the NFL. It was blowing off the boards and coming right back into our faces. It was so cold and then it was so hot. I had a glass of orange juice, which I never drink, and I threw up all over Guy Carbonneau's skates. The heat got me. So I reconnected with my old roommate and old center man by puking on his skates. That wasn't the first time he saw me throw up, either. Horcoff: Let’s be honest, those two teams, with the kind of talent they had and their past, I think you probably couldn’t get two deeper organizations when it came to big-time games. So that was just a really cool experience, to meet a lot of those guys. Beukeboom: I always said all along, this group of guys was very special in my life and a big part of who I was. You touch base with them again, it seems like you never miss a beat. It seems like time stood still when you have conversations with them. Brian Skrudland, Canadiens alum: For the alumni, it's probably the funnest day of hockey in their lives. They haven't been outdoors since they were kids. It's a great day to be able to talk with some old friends. And it's nice to see the fans relish it as much as they have. Charlie Huddy, Oilers alum: It was fun just to get out there and play against Montreal and some of their guys that maybe you hadn't seen in a while. It was just a great atmosphere. I think that's the thing I enjoyed the most about it, just the setting, the amount of people in there and the way the rink was set up on the football field. At the end of the day for me, it was a once-in-a-lifetime thing. Cam Connor, Canadiens alum: For me, the two biggest guys I was closest to [as a player] were Larry Robinson and Guy Lafleur. I was so excited to see them again. I would say it was probably 15-20 years [since I last saw them]. That was just a thrill. Stoll: I remember getting dressed for warmups and they had the alumni game before us so we were peeking out from the dressing room and watching it on TV. Just to think of all the guys that were on the ice at the time. You got Gretzky, [Jarri] Kurri, [Glenn] Anderson, Messier. And then you got Montreal’s side. It was special. Connor: Of the 22-25 players on each side, there were only two guys who didn't have Stanley Cup rings. One was Russ Courtnall and the other was Ron Chipperfield. Larry Robinson, Canadiens alum: My wife only saw probably about the first 10-15 minutes, and then she waited in the tent, because it was so darn cold. It was great to be a part of. The alumni game was so good, that an active NHL player, Mark Messier, refused to miss it, despite the fact he didn't play for either team involved. Of course, Messier grew up as part of the Oilers legendary dynasty, but he was playing for the New York Rangers in 2003. Glen Sather, who coached the Edmonton alumni game, was also Messier's general manager in N.Y. He backed Messier's bid to play in the Legends Game and helped his star center get the proper approvals to take part in the celebration of Edmonton's glory days. LaForge: Nobody had ever heard of it. He had to get freedom from the League, from a whole bunch of things. But it all happened. Mark said "I'm coming anyway. Somebody else can do the paperwork, I'm going to play." Beukeboom: That was unusual. There's no doubt about that. That speaks a lot about the people involved; the respect that Mark had for the city and the organization and people involved in the organization. He just thought it was really important to be part of it. Skrudland: That's why I was bummed. I had just retired. I was going to check him and then they made me a coach. So that tells you about my skill. Connor: He would have dominated both teams. His legs were still strong and skating was what he was all about. I think he toned it down. He had that ability to definitely dominate if he wanted to. But he took it easy on us. Nilan: He wasn't out there wheeling around and taking advantage of the situation. A classy guy. Really, it was appropriate that they won the game. It was a good game, we tried. The alumni and regular season games may have provided a memorable spectacle, but anyone in attendance remembers that day most for the bone-chilling cold. Those extreme temperatures forced players and fans to find ways to stay warm. Beukeboom: It was probably easier for the players on the bench than it was for the fans because we had heat pumped in on the bench. Of course, they didn't have that in the stands. I remember having an alcoholic drink in my hand and it freezing. That's how cold it was. [That was] during the actual game, not the game I played in. Eric Brewer, Oilers defenseman: It was much colder the day before the game, I remember. We went out on the ice [for practice] and the ice was just brittle, it was so cold. We hadn’t yet decided what kind of heat gear we would wear. But when we got out there the first day we thought to ourselves, "Oh boy. This is going to be a bit of a challenge." Jose Theodore, Canadiens goaltender: I just remember when it was game day, it was freezing to a point where we talked to our team rep and said "it's just too cold." There was talk in the dressing room about maybe postponing it. At the end of the day, we made it happen because we really wanted to do it. Graham Rynbend, Canadiens athletic therapist: We raced around like crazy trying to think of all the things we would need for a game like that. In the end, you always feel like you’re never prepared enough for it. But I think we did OK. We had the soups and we had the thermoses and the hot liquids and the heat warmers and the things for your toes. You name it, we had it. Pierre Gervais, Canadiens equipment manager: I didn't know about that cold-weather underwear, so [Green Bay Packers equipment manager] Red Battie gave me the companies he was using and he kind of warned me that it was very warm. I had to buy three or four of each because of the sweat between periods. So I had to have three different kinds of underwear, times three for each player. That’s a lot of underwear. The other piece of advice [Battie] gave me was to have enough socks to change them every period. Smyth: We had balaclavas on covering the ears and everything. I had some of those hand warmers, those heat packs in my gloves which helped out. Horcoff: There were heaters on the bench and it was so hot that you were just dying to get on the ice. And when you got on the ice, you were dying to get off. There wasn’t a happy medium. We had those hot pockets in our toes just to keep our toes from freezing. Ty Conklin, Oilers goaltender: From what everybody said, the benches were really warm. I didn't really find that on the ice. It didn't really help either that we carried the play for a good chunk of the game. Theodore: The goalies, we had it the worst. Players would go on the bench and it was like a five-star resort there. They had heaters and hot packs, whatever they needed. Me and Ty needed to stay in net. Rynbend: We had chicken broth. We had warm tea. That seemed to be the popular one, the warm tea with honey. All the Russians loved it. So everyone was sipping on this stuff and then they asked if they could have it on the bench too. So we rolled with it. Me and my assistant at the time [Jodi Van Rees] concocted an idea that we needed to have warm beverages at all times. We figured out that the bottle within five minutes would be cold. So we had two coolers on wheels and some smaller coolers. My assistant would prepare the drinks in the water bottles [in the dressing room], throw them in a cooler and then wheel them out to me [on the bench] and I’d hand the cold ones back to her. Bill Ranford, Oilers alum: Dwayne Mandrusiak, the equipment guy for the [Canadian Football League's] Edmonton Eskimos, suited me up with what they wear in the CFL for their playoffs in the snow. It was a full one-piece with a hoodie. The toughest part for me was I had to sit for the first 30 minutes of the game. The way the heaters worked [on the bench], they cycled [players] in fours. While it was cycling to the other part of the bench, I was over by the penalty box. It was pretty chilly. I got it one every four cycles. Ryder: They had heaters behind the bench and we even had to turn them off a little bit because it actually got too hot. Gervais: The sun was up, and it wasn’t supposed to be up that late. Even if we had the eye black, for a little while that was a major issue, especially in warmups. But there was nothing we could do about it. We couldn’t have them play in sunglasses, obviously. LaForge: The people who really paid the price were the fans. They bought the tickets, they sat in the seats and the conditions were absolutely harsh. And most of them stayed for the whole six hours, which is unthinkable. Stoll: It was minus-22 Celsius, and the following day was minus-2. Figure that one out. The day at Commonwealth Stadium was already a grand success before the puck dropped for the regular-season game between Montreal and Edmonton. However, the competition level was high for a game worth two points in the NHL standings. From the moment they took the ice, players on each team knew this wasn't just any other regular-season game. Even the fact that Montreal took the contest, 4-3, couldn't dampen a special day for the city of Edmonton. LaForge: The smiles on the players' faces were pretty serious. Ryan Smyth, the smile on his face to play that game, it was incredible. I remember standing at the glass and watching him go by. The smile on his face was just a frozen memory for me. Ryan has done a lot of things, but I think if you asked him he would say that was one of his great memories. Smyth: It was awesome. It was a unique experience because of how cold it was, for sure. It’s something that I'll look back on and say how honored I was to play in that game. Radek Dvorak, Oilers forward: When I stepped on the ice that morning, I looked up and there were blue skies. It was hard to concentrate. I had to tell myself, "Get focused. You've got to play an NHL game tonight." It's tough to describe in words. As soon as you walked out of the building, you could feel that excitement. People started cheering. You could sense in the air that something special would happen. Claude Julien, Canadiens coach: We kept trying to tell the guys to just try and play it as normal as you would inside of a rink because it did have a different feel out there. The biggest thing was trying not to get too overwhelmed by the whole thing, but realize that this is a League game and it counts for two points and could be a real important two points by the end of the year. So enjoy it, but just don’t get overwhelmed with it. Jason Chimera, Oilers forward: I know I wasn't playing much back then, so the benches were really warm, so that was a good thing. It was just a cool moment, especially for me being from Edmonton. I think it was one of those things that you remember for the rest of your life; kind of like it was yesterday. Brewer: It was very much a throwback type of game because it was so cold. Guys were wearing facemasks and all kinds of stuff. But once you’re into the game, you’re into the game. All in all, it was an NHL game, for sure. Ales Hemsky, Oilers forward: Actually the bench was pretty hot, because we had the heaters. But then when you got on the ice, it got really chilly. The sticks got really heavy. Dvorak: Once you started the game, you're focusing on the game. But seeing all those people around is like, "Wow! Am I dreaming or playing a hockey game?" At first, it didn't feel like playing an NHL hockey game. It felt like you were out there playing with your buddies. Once you got to your second shift, it felt like regular hockey. One of the signature moments of a memorable day was Theodore coming out for warmups wearing a commemorative Canadiens wool cap, or toque, atop his mask. That cap ended up spending the entire game on his head, adding an extra element to a historic day. Conklin: I didn't know he was going to do that. It was pretty inventive, for sure. I don't know how he got it to stay on. Did he have it screwed on? I would think that thing would get knocked off at one point. I want to know how he kept it on. Did he glue it on or something? Theodore: We had a practice the day before and the old-timers had a practice and they had the toque on during practice with the pom-pom and the vintage kind of look. When my brother saw the practice, I think he saw Guy Lafleur skating around with that toque. He told me it would be real cool if I put it on top of my helmet. So I kind of kept it in mind. I talked to Gervais and his assistant, Bobby Boulanger. Bobby did a great job of putting tape in so it stuck properly. I thought I would put it on for warmups and then take it off for the game. After warmups, all the guys said, "It looks so cool; you've got to keep it for the game." Gervais: He came to the bench and said, "You know what, I could use something on my head because I can feel the cold." So my assistant then, Bobby Boulanger, just used some two-sided tape and stuck it on his helmet. It sold a lot of toques. Conklin: I think [Ryan] Miller copied it the next time around [at the 2008 Winter Classic in Buffalo]. He [Theodore] was setting a style precedent. The day-long affair in Edmonton sparked a lot of old memories for all involved. For the players, past and present, who skated that day, it provided some brand new memories that won't be forgotten. Horcoff: The best time was the day or two before when we got to practice in our helmets. Just put the skates on and went out to skate around a little bit. Inside a stadium looking around, I can’t remember how many people were there, but it was just a really cool moment. Minus the stadium, it was exactly what it was like when I was a kid. Connor: My son was pretty young when I was playing hockey. This was the first time he got to see his dad play as a pro. It was very special to have them up there. Even though a lot of us didn't have what we used to have, it was such a thrill to have them in the audience. Nilan: Billy Hanson, my high school coach, came with me and got an opportunity to see it. Mr. Hanson was always a disciplined guy but I really realized how nuts he was when I was skating around in warmups and he was standing by the glass behind our goalie drinking a beer. I thought he was nuts. He was drinking a cold Budweiser when it was 40-below. Theodore: When I played in that game, I felt the same kind of feeling I had as a kid going to the park and skating with a couple of older guys and being in net and being cold. Five years after that incredible day in Edmonton, Buffalo hosted the first installment of the Winter Classic. That outdoor game has since become an annual affair and one of the marquee events in all of sports. The Calgary Flames played host to Montreal in the 2011 Heritage Classic while the Vancouver Canucks will welcome the Ottawa Senators in the 2014 installment, one of six outdoor games to be played during the 2013-14 NHL season. Remarkably, Conklin followed up his 2003 Heritage Classic performance by appearing in the next two outdoor games; the 2008 Winter Classic in Buffalo as a member of the Pittsburgh Penguins and the 2009 Winter Classic in Chicago as a member of the Detroit Red Wings. Conklin: The scope of it is what got me the most. Truthfully, it's what got me in all of them. I feel pretty lucky to have played in a number of them. It's a weird coincidence that I was in the first three of them. It's not anything you can prepare for. Smyth: It was an honor to kick it off, to start the outdoor games. I didn’t think they would go on to have this many. Chimera: For that day, even if you weren't a hockey fan, everyone was tuned into that game. It was a good day for hockey. I think it really spearheaded what's going on now with all these outdoor games. It was a chance to really put hockey on the map. Mike Ribeiro, Canadiens forward: It's amazing that it's been 10 years already. I don't know if that was supposed to be a one-time thing, but to see it really explode over the years and become something everyone looks forward to is amazing. It took us all a while to understand this is a game that counts, you've got to get after it. Hemsky: It’s gotten bigger than we thought it was going to get. But it's fun for the fans and it's fun for the players to get a chance to play in different stadiums. It’s good for the League. LaForge: I had a lot of reasons to believe that it was going to be a super event. Only the weather had a chance to interfere. People cried. It was very emotional. If you love the game as much as Edmontonians do and a lot of people in Canada, it was an emotional event to see NHL players take the game back to grass roots. Craig: I knew this was going to be an annual gig when we did Buffalo [in the first Winter Classic]. I knew when we did the national anthem in Buffalo and I stood there and you had 72,000 people [in the stadium]. You just look and people have no idea what is going to be going on here.